Line a baking sheet with parchment paper or a silipat. Set aside. In a small sauce pan bring the cream, butter, half of the water and salt to a boil. Set aside. In a medium sized, heavy pan, heat the sugar, the rest of the water and corn syrup to a boil, stirring frequently, until the sugar dissolves. Boil until it turns a light golden color. Slowly, carefully stir in the cream mixture. Stir until the caramel is 255 degrees (just beyond softball stage so it isn't too soft and runny). Remove from heat and carefully dip the apples in the caramel. Place on lined baking sheets to cool. If the caramel is a little thin, let it cool slightly then re-dip. Cool. Meanwhile, melt the butter and chocolate. Drizzle over cooled apples. Sprinkle with sugar, sprinkles and/or candy bits. 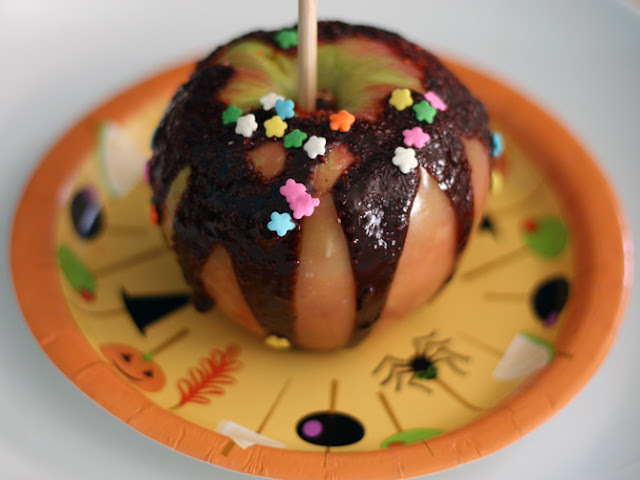 As if dipped in caramel is not a decadent enough way to eat an apple, it seems that the trend now is for these chocolate and candy dipped mega apples that are just dripping with sugary treats. I wasn't quite up to making or eating an apple that quite that extreme but a little bit of chocolate drizzled (not dipped!) over the caramel sounded perfect. So I came up with this, a little fancier than the typical caramel apple but not over the top and very easy to eat using just a bit of chocolate sprinkled with sprinkles and a bit of orange colored sugar. I used some very large, round tart apples but any largish apples would work. I prefer tart apples because it sweet apples make for a super sweet caramel apple. Tart apples provide more of a contrast. I also don't use a candy thermometer-just a clear cup of cold water by the stove that drop bits of caramel in after it is has been boiling awhile. I waited until it formed a soft ball and then boiled about 1 additional minute until it formed a slightly more solid ball but wasn't brittle. 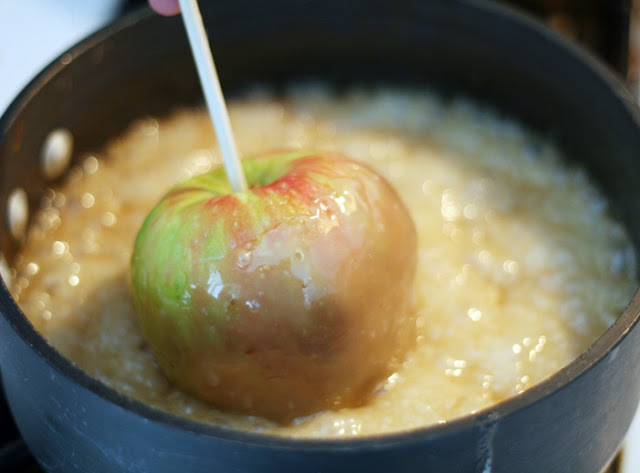 Note: the trick to making caramel apples and not having all of the caramel pool to the bottom is to boil the caramel to just past softball stage. This makes the caramel a little less filling-pulling-out sticky and keeps it in place, even over the course of a few nights.